I enjoy transcribing early 19th century obituaries. The language of the time is almost lyrical. I do dislike the run-on sentences, though! The subject of this obituary is Mr. Elisha Hammond, a known educator in South Carolina and Georgia. He was also the father of James Henry Hammond, governor of South Carolina 1842-1844. 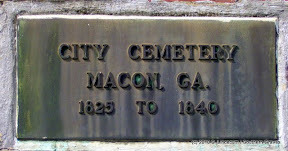 According to an 1893 newspaper article, Mr. Hammond was buried in Macon's Old City Cemetery upon his death. His interment is mentioned again in an article from 1907. However, it seems any marker he had is not to be found today. Unless it is one of the few still standing that are completely illegible. The following photo shows the current cemetery landscape. You would never guess there were possibly as many as 700 burials there. Departed this life, on Thursday the 9th instant, after a painful illness of seven days, Mr. ELISHA HAMMOND superintendent of the Macon Academy, in the 53d year of his age. Mr. Hammond was born in Massachusetts, in the year 1776, and after receiving a collegiate education at Dartmouth College, he emigrated to South Carolina, where he was called to take charge of the Mount Bethel Academy; which from a state of prostration, he soon raised to notoriety and eminence. From thence he was called to the honorable station of professor of languages in the South Carolina college; and from his urbane and conciliating deportment, secured the esteem, the respect of all with whom he was connected. -- From Carolina he removed to Georgia, and after a short time spent in Augusta, accepted an invitation to take charge of the Macon Academy; and in June 1828 became, and continued to the period of his death, a citizen of this place. As was the case at Mount Bethel, Mr. Hammond assumed the management of the institution under circumstances altogether discouraging. With but a few scholars, and those generally very youthful, he entered an institution the fame of which had never extended beyond the precints of its own immediate neighbourhood; but he brought with him that experience and those habits of patient industry, which require only time to be known, in order to be appreciated and rewarded; -- and for after one short year devoted to these his useful labors, the citizens of Macon enjoyed the cheering prospect of beholding this (heretofore neglected) institution assume a position at once gratifying to them, and highly honorable to himself. In private life, Mr. Hammond from his dignified and amiable deportment, had secured to himself a circle of friends, whose expressions of bereavement bear ample, and undoubted testimony to the esteem in which while living he was held; and that though dead he will long be remembered. Taken away in the midst of his usefulness, Mr. Hammond has left a widow, and four children to mourn his irreparable loss; -- but if the sympathy of a community can afford consolation in such extreme affliction, their tears will soon be dried, for the citizens of Macon consider this afflictive dispensation as a public calamity. Farewell! my friend; -- when I beheld thy dying eyes (intelligent even in death,) upraised to Heaven, and after the power of utterance had left thy palsied tongue; methought thy spirit did commune with those ethereal messengers commissioned by that Saviour (into whose merits while living you so earnestly inquired) to convey your disembodied spirit to mansions of eternal rest. Farewell!